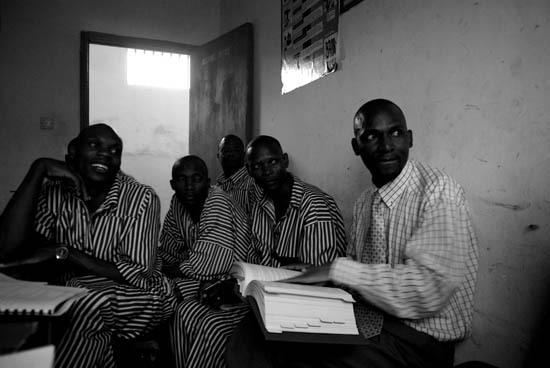 On Wednesday afternoons, Peter Onyango, a Justice Makers advocate and Rodney Oluoch , a CLEAR pro bono lawyer set out to provide legal training to inmates at Kibos Prison. For two hours, the prison’s small welfare office is transformed into a makeshift law school. Fourteen students in black and white stripped uniform crowd into the small room carrying notebooks and pens provided by CLEAR. The course runs March through August, providing prisoners with practical legal training so that they can advise fellow inmates and represent themselves in court. Having taught the prisoners how to prepare the documents required to mount an appeal, today’s lesson addressed the procedure of an appeal hearing. The inmates questions challenge even the advocates at times. Some cite clauses by number, requiring Peter and Rodney to flip through books on Kenyan law before responding. One prisoner has developed a new line of argument to challenge the robbery with violence charge, and the room breaks into discussion as prisoners and advocates alike test the idea. The inmates are serious students. With limited access to law books, they have begun to transcribe the criminal procedures code by hand and hold group discussions to prepare for hearings. Many prisoners are capital offenders, convicted of either murder or robbery with violence which carries a mandatory death sentence, and will likely live and die in prison. Their only hope is to mount a successful appeal. Peter and Rodney advise prisoners on how to prepare their documents, developing lines of argument, and representing themselves well in court. The Court of Appeal – Kenya’s highest court is very careful when confirming or dismissing a sentence. The rules are highly technical and the courts unsympathetic, so knowing the law – and how to argue it, can make all the difference. The Kibos program is supported directly by the International Bridges to Justice – JusticeMakers grant which funds transport and material costs.